Well, no one can say Facebook is hiding its privacy policies any more. The network just proposed updates to clarify the information it collects on you and how it uses that data to sell ads. Facebook also turned its privacy check-up into an animated interactive tour in a new section called Privacy Basics designed to guide confused users through every available setting. The visual overhaul of privacy controls is part of Facebook’s updates to its terms of service and data use policies, which are open to public comment for the next seven days before Facebook finalizes them. The network hasn’t actually changed or added any privacy settings, just made them easier to understand with the new guide, which covers basics like how to delete posts and change the audience of a status update from public to friends only. Why this matters: In its early years, Facebook made decisions that led to its current reputation as a careless company when it comes to user privacy. The network has made a serious effort to change its ways—and change your mind—especially in recent months, but even though Facebook is being more up-front with you, it continues to collect information that many will find down right creepy. The proposed changes to Facebook’s terms, data use, and cookies policy are ahead of new features the network plans to roll out. 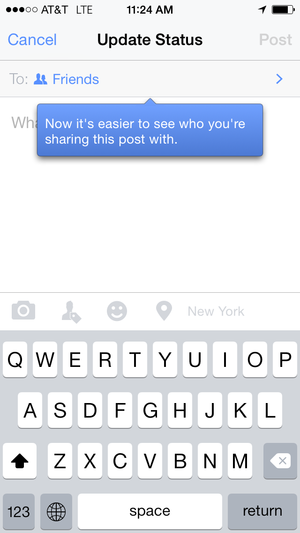 Facebook has simplified its privacy controls in recent months. The network is also testing a Buy button and experimenting with other mobile payment offerings, and said it plans to store details like debit/credit card numbers, billing and shipping addresses, and contact information. Facebook’s new data policy, which is reportedly 70 percent shorter than the previous version, spells out what information the network collects on you, but the new data use policy might as well spell out what the company doesn’t save—it would probably be even shorter. If you don’t want Facebook tracking your activity around the web, you have two choices: Don’t use Facebook, or opt out through the Digital Advertising Alliance. Facebook has participated in the DAA’s opt-out program for awhile, but before Thursday’s update, your opt-out has only applied to sites you visit on your desktop. Now it will apply to sites and apps you visit on all of your devices.